Blurb: Aaron Littman is the premier lawyer of his generation and the chairman of Cromwell Altman, the most powerful law firm in New York City, when a high-profile new client threatens all that he’s achieved – and more. Nicolai Garkov is currently the most reviled figure in America, accused of laundering funds for the Russian Mafia and financing a terrorist bombing in Red Square that killed twenty-six people, including three American students. Garkov is completely unrepentant, admitting his guilt to Aaron, but with a plan for exoneration that includes blackmailing the presiding judge, the Honorable Faith Nichols. If the judge won’t do his bidding, Garkov promises to go public with irrefutable evidence of an affair between Aaron and Faith – the consequences of which would not only destroy their reputation but quite possibly end their careers. Garkov has made his move. Now it’s Aaron and Faith’s turn. And in an ever-shocking psychological game of power, ethics, lies, and justice, they could never have predicted where those moves will take them – or what they are prepared to do to protect the truth. Review: I received a copy of this book for free in exchange for an honest review, all opinions expressed below are my own. 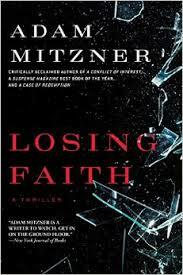 A couple of years ago, I read and reviewed A Case of Interest by Mr. Mitzner here on my blog. I thoroughly enjoyed it. So when I was given the opportunity to read and review Mr. Mitzner’s newest release I jumped on it!! And I am so excited to say that I really enjoyed this book. I had no idea going into the trial who or what to believe. Was Aaron guilty? Was he innocent? Who did kill Faith? I have to admit that I had someone else pegged as the murderer, so when it was revealed at the end I was in shock. I will also say that I enjoyed learning a little bit more about the legal system. I had a dream of law school immediately after my undergraduate years. A move out of state with my husband and real life intervened and I have to live vicariously through legal thrillers at times. So I was really intrigued by some of the twists and turns that occurred in the courtroom action of this book. The storyline in this one was interesting. The characters were well-developed. It’s just a really fun, easy-to-read book that kept me on my toes the entire time. Definitely one that I am glad I got the opportunity to read and one I would have highly recommend!! I just won this one in a giveaway and I’m looking forward to it!